Nestled in the Nusa Dua hills, our 4-star Nusa Dua hotel offers a private paradise in the popular precinct of Nusa Dua. Just 15 minutes away from Ngurah Rai International Airport and boasting unrivalled panoramic views over Nusa Dua Beach and Benoa Bay, the 190-key newly-refurbished resort features an exquisite choice of 151 rooms and suites ideal for a relaxing family holiday. 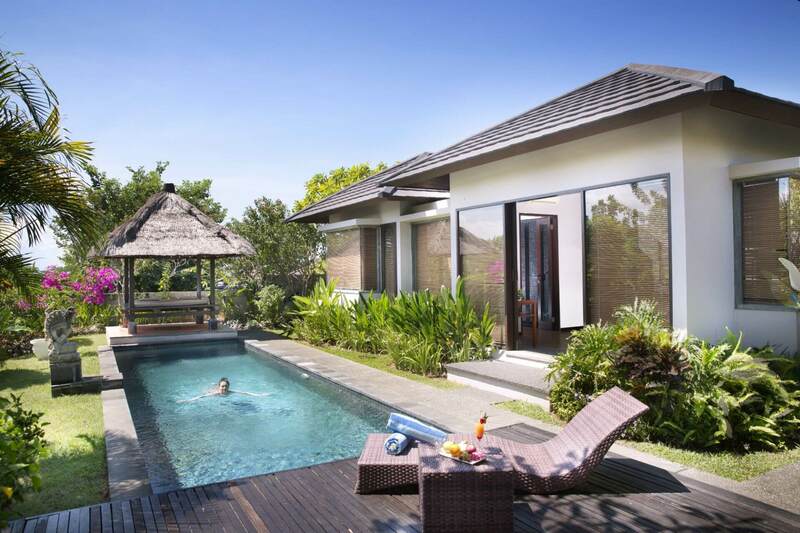 A collection of 39 one-bedroom and two-bedroom villas, each with a private pool and traditional Balinese pavilion set in a lush garden, and are also available for a romantic getaway. Stroll along the pristine beaches of Nusa Dua, soak up the tropical sun and feel the tickling of fine sand in between your toes. For adventure seekers, an array of outdoor and water sport activities await. Tanjung Benoa, just a 10 minutes drive from the resort, is renowned for a wide choice of water sports including scuba diving, parasailing, surfing and banana boat rides. For the avid golfers or seasoned players, head to Bali Golf and Country Club and swing to your heart’s content while taking in the spectacular view of the Indian Ocean. Should you wish to explore the rest of the island, Park Hotel Nusa Dua, Bali is within easy access to the beaches of Tanjung Benoa, Uluwatu, Jimbaran and the entertainment areas of Kuta and Seminyak. Embrace and take refuge in the lush surroundings coupled with loving hospitality at Park Hotel Nusa Dua, Bali. Nestled in the hills of Nusa Dua, Park Hotel Nusa Dua, Bali is the perfect oasis to relax in seclusion or embrace nature at its best. Admire the panoramic views of Tanjung Benoa Bay and the sacred Gunung Agung from the comfort of your room or set out to explore the many leisure facilities and cultural sites located nearby. Voted one of Top 10 Islands in the World in TripAdvisor 2015 Travellers’ Choice Awards, Bali, also known as the island of Gods, is a much-loved island for its unique culture, magnificent volcanoes, iconic rice paddy fields, pristine beaches and stunning natural scenery.